Boost Home Equity by Installing a Cupola and Weathervane | Although all cupolas today are not as functional as in the old days, they do add to your homes charm. A cupola on a roof is an architectural decorative touch that although timeless, is currently gaining in popularity. Quite a few custom-built homes are built with one. Why? It lends curb appeal. 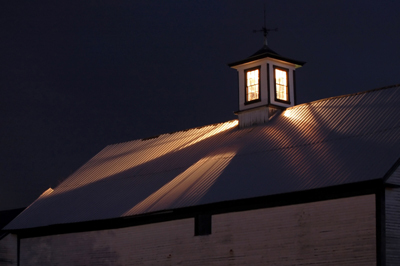 Although today many cupolas are added as a decorative touch rather than functional, that wasnt always the case. Back in the day they functioned as a lookout point (also called a belvedere), a belfry, for ventilation purposes, or similar to a conventional skylight, to admit light into the interior of a building. For this last case they were called a lantern. Add-on type cupolas are generally prefab units, although building one yourself from scratch is a doeable DIY project. First, consider size ; it should be visually appealing and in the proper proportions to your home. Of course theres room for flexibility, but the commonly accepted rule is a ratio of 1 inch of cupola width for every foot of the length of your roof ridge. So consider, if your roof is 40 feet in length, your cupola should be approximately 40 inches wide. Most homeowners do online shopping because most home improvement stores simply dont stock this type of items. Kits usually come in sections composed of a base, a roof, and perhaps a midsection, depending on size. Generally they are constructed of vinyl. There are several good reasons for this; they are easier to work with, theyre lightweight for shipping purposes, and vinyl is weather-resistant. It can be installed either straddling your ridge or partway up the slope of the roof. In this article well talk about how to install it on the ridge; thats the most common approach. However, you might want to consider the other configuration if you have ridge vents. Determine the pitch of your roof. This is rather simple by using two 1 X 4 boards either nailed or bolted together at one end. Think of the capital letter V; now, when you turn the wooden V upside down and adjusting it onto your ridge, just physically note the angle of the pitch. Dont forget to add another bolt or nail so you wont lose the angle. Now, using the boards as a template, transfer your angle to the 2 opposite sides of the base unit. Mark the cutting lines from the corners up to the center with a Sharpie. Using a jigsaw, circular saw, or heavy-duty snips cut the angles out of the base unit and set it on the ridge. Cut 4 cleats out of a 2 X 4 board. Next apply some high-quality caulk liberally to one side of the cleats. These will be used to secure the base. Place the cleats on either side of the roof ridge on the inside the base unit, the caulk side facing down. Drill pilot holes, and screw the cleats securely to the roof. The caulk is to be sure that no rain water can get to the screw holes and cause a roof leak. Still, use galvanized, brass, or some other kind of coated screws. Drill pilot holes through the cupola base. Secure it to the cleats with screws. Again, use brass screws or another type specifically designed for exterior use. Assemble the remaining modules of the unit per manufacturers instructions. Apply caulk around the bottom of the base where it meets the roof. Just to add that classic touch, why not add a weathervane or finial and dont forget the cost of this project when its time to update the homeowners insurance policy. © 2011 Kelly Smith all rights reserved; content may not be copied, rewritten, or republished without authors written permission.